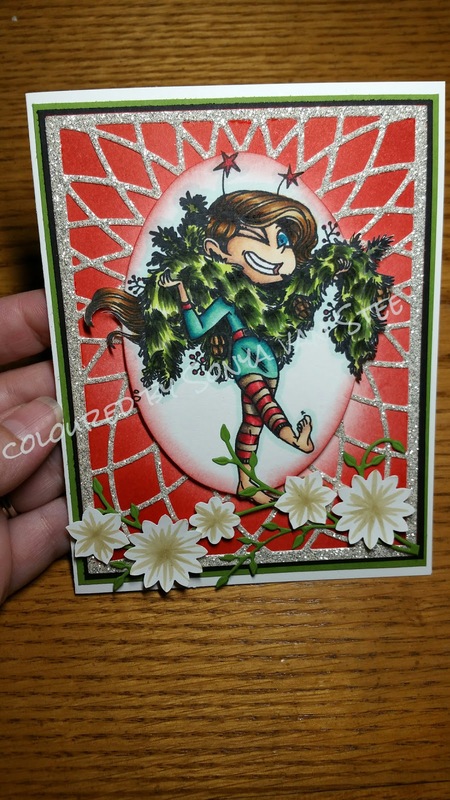 Check out Holiday Sissy from Kraftin' Kimmie Stamps! She's all set for the holiday decorating. Isn't she adorable?! She is coloured up with mostly Copic Markers (with a few Spectrum Noir colours that I don't yet have in Copics) and mounted on a die cut (unbranded die from my stash) and matted on various coloured card stock. 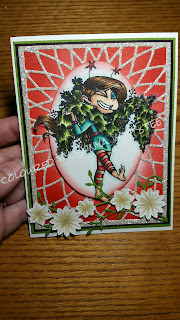 The red layer behind the sparkly silver is sponged with Real Red ink from Stampin' Up! The flowers are from a retired Stampin' Up! punch, and the greenery is another unbranded die from my stash.